Place the bonless thawed turkey breast on top of the carrots and apple in the slow cooker. Season the turkey breast with garlic powder, onion powder, ground black pepper, basil, thyme, sage, salt, rosemary, and fresh parsley. Mix together the chicken broth, butter, and minced garlic, heat until the butter is melted, then pour it into the slow cooker. Pour the 1/2 cup of Head Country Apple Habanero Bar-B-Q Sauce over the turkey breast. Roast the turkey at 450F for 10 minutes. Remove from the oven and place the turkey breast on a platter, slicing it into 1/2 inch thick pieces to serve. Serve the sliced turkey topped with more Head Country Apple Habanero Bar-B-Q Sauce. 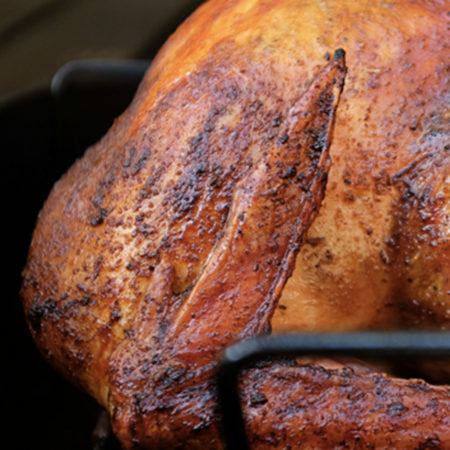 TIP: Roasting the turkey in the oven after cooking in the slow cooker makes the skin on the turkey crispy and browned.